It may seem strange to read that, but it happened as I was waiting for the theatre to begin letting us in. I watched as an employee cleaned up with a carpet sweeper. 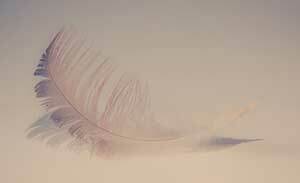 I first thought of Dear Old Gran and how she kept an immaculate house mainly because she did frequent cleanings with her old-fashioned carpet sweeper. I decided to investigate to see if people, other than cinema employees, still used these relics from the past. I was delighted to learn that not only did people still use carpet sweepers but that they had been updated with modern technology. It was a no-brainer that I had to do some research on the best carpet sweepers. More specifically to research the best rechargeable carpet sweepers. For those short on time or just not inclined to read an entire article about carpet sweepers, below is my quick list of the best carpet sweepers by category. Keeping a tidy home doesn’t mean deep cleaning, it usually means keeping up with the small cleaning jobs to prevent a big clean up from being necessary. That makes a carpet sweeper the ideal tool to keep your home from getting to untidy, to begin with by making it easy to stay on top of the cleaning. Here are just a few ways I think it makes a lot of sense to own a rechargeable carpet sweeper. Let me first say, though, that they aren’t just for carpets. A good carpet sweeper should also work great on hard floors. 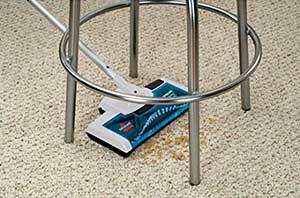 To keep up with little spills or to freshen up a carpet means it has to be convenient to do so. Carpet sweepers are lightweight and can quickly spot clean an area. Taking the vacuum out for a quick hoover can mean more time getting it out of the closet, finding a socket, cleaning, then taking it apart to put away again than it does to actually do the cleaning. Since the carpet sweeper doesn’t actually use a vacuum, it is very quiet. A motorised carpet sweeper uses a rotating brush that simply pushes the debris into a pan right behind the brushes. It doesn’t need lots of energy and power to send the debris up a tube and into a canister. It’s not just that carpet sweepers are easy to use because they are lightweight. They are easy to use because they are so simple. There are no bags to change, they don’t lose suction, they don’t get clogged, and there are no filters to wash or change. For the elderly among us, sweeping with a broom and bending over for the dustpan can be too much. Using a cordless carpet sweeper is a great way for seniors to do some light cleaning with little pressure on their back and joints. Carpet sweepers are much easier to store and keep within arm’s reach than even the smallest vacuums. They can be hung on a hook on the closet door, or in some cases folded away and put up on a shelf. 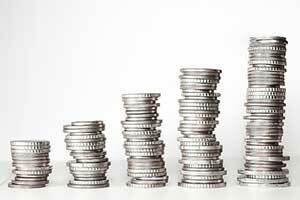 Carpet cleaners can lighten up your electricity bills not only because they don’t use much electricity to charge, but they also mean less time using a big hoover. The less you have to vacuum, the less you have to spend on your electricity bills. If you understand what a carpet sweeper does and what it does not, or rather should not, be used for, then you won’t fall victim to buyers remorse. A carpet sweeper is not meant to replace a vacuum. It should be just another weapon in your cleaning arsenal. You likely use your vacuum to hoover on hard floors, yet, still have a broom. It’s the same concept with a carpet sweeper. That said, here are a few disadvantages to using a carpet sweeper. Carpet sweepers rely on the strength of the rotating brush as they don’t use any suction. Sometimes to get stubborn pet hair or larger debris, a strong vacuum is necessary. If you have a shag rug or one with mid to deep pile, your carpet sweeper will be at best, ineffective, at worst damage your rug. They simply aren’t meant for certain surfaces. If your area to clean is mostly deep pile rug, then you may want to consider if you really need a carpet sweeper. Unless your flat is extremely small or you opt to clean every day, then your carpet sweeper won’t be able to replace your vacuum. It would take far too long to clean an entire home with a carpet sweeper. Not to mention that eventually debris and dust will make its way to the bottom of the carpet. Since there is no suction, a carpet sweeper simply cannot get all the way down. To reiterate, it is a very good idea to have a carpet sweeper in your home. It’s not a good idea to use it to replace your vacuum. Seeing as how a purchase of a carpet sweeper is usually to accompany a vacuum, most don’t want to spend too much on one. Fortunately, even the higher end models with all the bells and whistles can generally be had at a good price that reflects what it will be used for. As is the case with a vacuum, make sure you’re paying for what you actually need. Some of the higher end models may have accessories or features that you simply won’t be needing for some jobs. No need to pay a higher price for features that won’t be appreciated. The brushes are the most important aspect of the carpet sweeper as it is what does all the work. Pay attention to what type of brush is best for the surface you wish to clean. Some brushes are great on carpet but may be too rough on some hardwood floors. Alternately, some may work wonders on linoleum, but have trouble cleaning a carpet. How much manoeuvrability you need will depend highly on what is in your space. If you have a lot of furniture then look for a narrow pad and a swivel handle to get around tight areas. If you have a wide open space, then the manoeuvrability won’t be as big an issue. In this case, a wider head that covers more area will make less work for yourself. Most rechargeable carpet sweepers are not meant to be used for large cleaning projects so they are not designed for extended use. Thus, battery life will vary a great deal. If you plan to use your sweeper often then the charge time will also be a factor in your purchase decision. The beauty of a carpet sweeper is that it is typically low maintenance. Make sure that your sweeper is not overly complicated and can be cleaned and maintained easily. Some feature removable rollers that can be cleaned out. That’s really all you need to know when researching the right carpet sweeper for your needs. As with everything, be sure to do a proper evaluation of your cleaning requirements before trying to find the right one. The best carpet sweeper is the one that does the best job according to your circumstances. It should come as no surprise that the best selling rechargeable carpet sweeper on Amazon.co.uk is from Bissell. They invented the original carpet sweeper over 100 years ago! With the kind of history behind it, they have perfected the carpet sweeper. It may not be flashy or impress with lots of lights and gadgets, but what it does do is give a deep clean on just about any surface. The rotating brush is gentle on floors but will still give a carpet a good beating to remove deep down debris. It is not ideal for cleaning deep pile carpets, however, and may struggle. It doesn’t have a swivel to get around tight corners, but it is compact and easily navigates furniture and angles. It cleans remarkably close to the wall edge, as well. It’s lightweight so perfect for a quick grab and go clean up. The battery gives you 45 minutes of cleaning time. More than enough for just about any job. Most times it takes less time to give a full hoovering for a home. Though it takes a while to charge from a spent battery, most times you are more likely to be charging in between uses when your battery still has some life left. The one-touch dustbin emptying system is nice to keep hands clean. The box opens up directly over your bin with the touch of a button. The Bissell Supreme is a great little electric broom that won’t cost a fortune, yet gets the job done well. As you would expect! 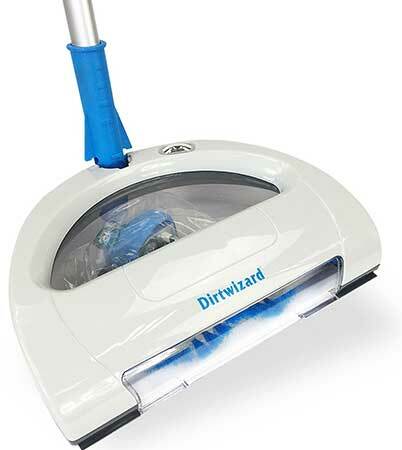 The next most popular rechargeable cordless sweeper is from Dirt Wizard. Though it lacks the pedigree of the Bissell, the fact that it is 10 pounds less may lay a big part is its popularity. It does do a great job at cleaning. Especially on hardwood floors as the brush bristles are gentle on floors. It does well on carpets, as well. Though if you have a deep pile carpet, you may want to consider a different model. Cleaning time is an impressive 3 hours on a full charge. Of course, you are not likely to need 3 hours with your carpet sweeper, but it’s nice to know if you neglect to charge it after cleaning up, you will still have some battery life for the next use. Emptying the dust bin is easy and mess free. Maneuvering is a bit tricky around furniture, however. The design of where the handle attaches to the body could have been better thought out. That isn’t to say it’s a chore to use it when you have a lot of furniture, though. The price reflects what you would expect from a rechargeable carpet sweeper. For the price, it does what you need it to do but won’t leave you feeling like you got the deal of the century. When you have pet hair, even in between cleaning jobs need the big guns. You can’t really wait until you have time to do a full vacuuming clean up as the hair could be unsightly. That’s when the Gtech cordless Premium sweeper comes in very handy. It’s a very powerful cordless sweeper that acts almost like a vacuum. The battery is very powerful and lasts a full hour. Then recharging takes only four hours and a handy LED lets you know when it is fully charged. This is a small detail that often is not an option on other rechargeable sweepers. The rotating brush excels at cleaning pet hair and other stubborn messes that come with owning a pet. In addition to the roller, there are horizontal rotating brushes on the corner that help clean right to the wall edge. An unexpected bonus for pet owners is the germ guard which kills most bacteria from the dust that it picks up. The swivel joint at the base of the handle means you can easily navigate any of the furniture in the room. Including underneath the sofa and tables. The front visor comes off so it is also suitable for cleaning upholstery and stairs. Also helping to do this is the fact that it has telescopic tubes for the handle. Making it small enough to act like a handheld vacuum helps to get it onto the furniture and stairs without it being awkward to hold. You’ll pay as much as your average vacuum for the Gtech cordless sweeper, but you’ll find yourself using this more than you hoover since it cleans as well as most anyway. The roles could easily be reversed if you own this cordless sweeper. You may want to just buy a cheap vacuum for when you aren’t using the Gtech! If your pet has wiry hair and sheds a lot then the Black and Decker cordless sweeper is for you. It doesn’t have as many features as the Gtech, but it does have a couple of interesting features that set it apart from other rechargeable sweepers. Most notable are the side rotating bars. It makes it a much faster clean up when the sidebars are able to catch debris as you manoeuvre around the room. It gives excellent manoeuvrability that can go around furniture and under it. That is where the sidebars really shine. When you need to get under furniture it can clean up in one swipe in most cases. The bristles are spaced well enough to not end up with pet hair trapped within the brush. The downside is that it doesn’t do very well against fluffier pet fur. The quick release dust bin is a nice feature and opens wide enough for all the debris to come right out over your bin. 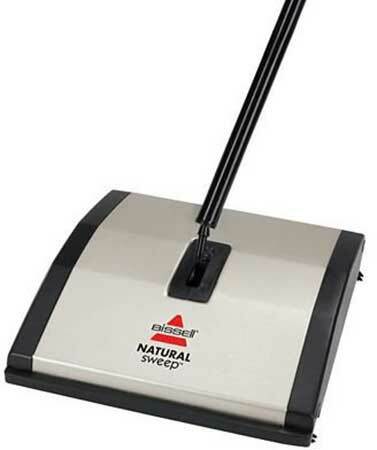 If you are looking for an economical carpet sweeper that is good at getting pet hair in between clean ups then you could do worse than the Black and Decker. When it comes to a low price you usually have low expectations. While the Pifco won’t set the world on fire, it does a very good job considering how low the price is. The triangular shape helps quite a bit since it is excellent at getting into corners. And it handles dirt right up to the edge of the wall. The brushes rotate in multiple directions so it picks up debris quickly making your clean up easier. It has a 360-degree swivel making it ideal for getting into those tight spaces. Emptying the bin is easy and the transparent cover makes it easy to see when it is full. It comes with a 3-year warranty so even with the low price tag the makers believe enough in the product to offer a money back guarantee. It does work best on tiled and hard floor but struggles with carpet that is anything more than a low pile or flat. This goes back to the buying guide where I recommend really understanding what your needs are before a purchase. The low price tag might be attractive, but since it does have a couple of shortcomings it may not suit your needs. Though a manual carpet sweeper might not be the most glamorous of cleaning equipment, it does have a place in the modern home. And leave it to Bissell to be the go-to choice when you need a good quality non-electric sweeper. It was likely this model I saw that day at the cinema, though unfortunately, I was not paying attention to the brand. They seem to be ubiquitous in establishments that don’t want to bother the patrons with a loud electric motor when cleaning up. For those that need a carpet sweeper for an off-grid cabin or vacation home or for those that really don’t like to waste electricity this is a fantastic option. 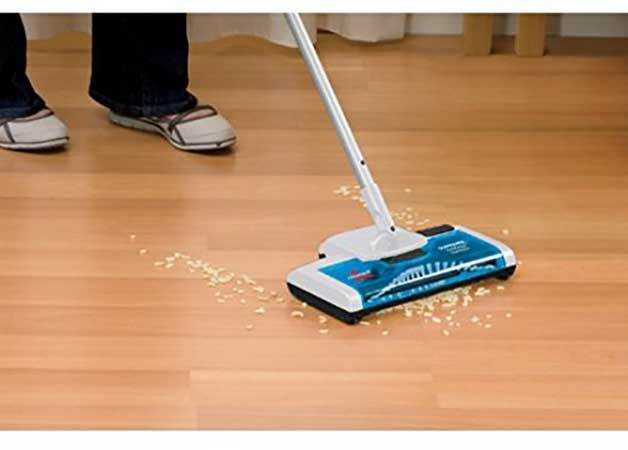 With no loss of cleaning quality, particularly on carpets, the Bissell sweeper makes quick work on those in between clean up sessions. With 2 large rotating brushes in the front and back and a stationary brush in the middle, there isn’t much the Bissell will miss. It’s very lightweight and manoeuvrable although it looks a bit stodgy. It swivels so it can get around tight areas without a problem. It could get closer to the wall edge, however. The only place it comes up short is on tiled floors. It simply can’t get fine debris in the space between the tiles. Well, two things, as the dustbin is a bit messy to empty. For those that like having something that requires no electricity and maintenance but still wants it to do a good job actually cleaning then this should come as a welcome addition to that cleaning kit.